STATE YOUR CITIZENSHIP. YES, PLEASE!! OK, so I hate to rag on my good cousin Walter, but I had to mention this story as a proper sendoff to our great Canadian roadtrip saga. I can’t imagine anyone passes through borders without a heightened level of anxiety. Granted, if you are hiding something then you have all the more reason to be afraid, but with most cases you get a guilty-until-proven-innocent lookover and then you are on your way (that is if your stop didn’t include a pullover and vehicle inspection). 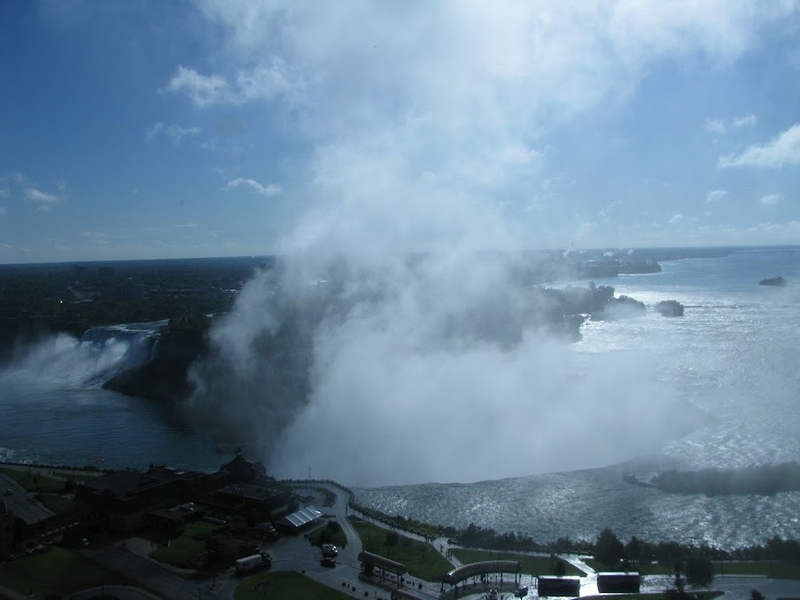 We exited Canada at Niagara Falls (picture above – enjoy it because I forgot my camera for the Maid of the Mist boat ride that day) and were asked plainly to state our citizenship. The first time I was ever asked this was by border patrol agents running a checkpoint just outside Marathon, Texas. It caught me of guard at the time, because of course I’m an American citizen and am used to more simple yes-and-no questions (Are you an American citzen?) in such procedures. I managed to blurt out “U.S.A.” that first time and while crossing Niagara, I stuttered “United States” after a second or two. Walter wasn’t so lucky. He couldn’t clearly see or hear the agent from his spot in the passenger seat, so when motioned by the officer for an answer, he said “Yes!” “Yes…what?,” relayed the officer. “Yes, absolutely,” said Walter. What begun was a frantically awkward 20-25 second back-and-forth exchange with me tucked in between the two. “Yes, absolutely I am,” said Walter again. “You are what?,” said the officer. I chimed in with a “Walter, you have to say IT,” worried that if I said “U.S.A.” I’d be accused of coaching him. I suppose I could have said “Walter, you have to say the country you are a citizen of,” but as usual, being looked over by a border official raises anxieties naturally, and responding in the heat of such an awkward moment can’t be expected. So my suggestion didn’t help. “You kept saying Yes, Yes, Yes, Yes,” said the officer. “I’ve never seen Yes on a map.” (Of course, I took this as a challenge. Walter possibly could have been from Yes Bay in Ketchikan, Alaska – the only place officially named Yes that I could find – but alas you can’t be a citizen of Yes Bay). I once drove home from visiting my sister in Calgary and for the first time was asked where I was born. I was used to the routine questions and my answers were routine, so it took me off-guard. I hesitated and replied, “Umm … Minnesota?” like I wasn’t sure of the answer. The agent’s response: “Please pull your vehicle over, ma’am.” Sigh.